Restart your Mac without the chime. Is there a better alternative to Psst? Is Psst really the best app in System category? 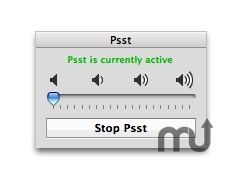 Will Psst work good on macOS 10.13.4? Important: The method Psst uses to change the volume does not work on every model... What it actually does: It simply adjusts the volume settings before shutting down and after logging in. Uninstalling Psst: just stop it and trash it! Psst needs a rating. Be the first to rate this app and get the discussion started!